Recently, I´ve been posting more pictures on social media platforms so that my friends and family can see what I´m up to. Since I get texts and emails daily asking ¨what are you doing?¨or ¨how is Spain?¨, I figured I was doing the right thing by allowing them to actually see pictures with brief details about how it is and what I´m doing. Well, the responses are mixed, but the general consensus is ¨Do you ever go to class?¨. I was so confused when I started getting this question as a response to my photos. Of course I go to class…I´m STUDYING abroad. But then I gave it some more thought. Do I? I have 5 classes I attend four days a week and I do get homework and projects and and papers and have to study just like any other semester. Granted, it is a lot less stressful than American university. But perhaps that is because the professors at the Centro de Lenguas Modernas – UGR know that sometimes learning isn´t always about sitting in a classroom pouring over a text book and scribbling down notes. Sometimes it´s about being present, talking with natives, exploring new cities, trying new food, cooking, making friends with Spaniards, evesdropping on natural conversations on the street. They realize that the classroom is only part of our learning experience, while other fascets, like our host homes and the street (where life really is lived in Spain) are just as important. So the answer to your question, folks, is yes. I do go to class. But I have been blessed with the unique opportunity to constantly be in class, to constantly view each moment of my day as a learning experience. That said, I spent one of the last weekends in April in Albufeira and Lagos, Portugal. Now, although my Spanish did not improve there, I was able to draw connections between their language, and mine (still learning, take that). This weekend was extrordinarily fun and relaxing for me. We were able to spend time on the beach, met new people, and spend prescious time with eachother. A group of 7 of us from API (my program for studying abroad) decided to go together. On our first night in Albufeira, we enjoyed the last few hours of sun on the beach and watched the sunset. When we returned to the hotel where we were staying, we all cooked a dinner in the kitchenette. 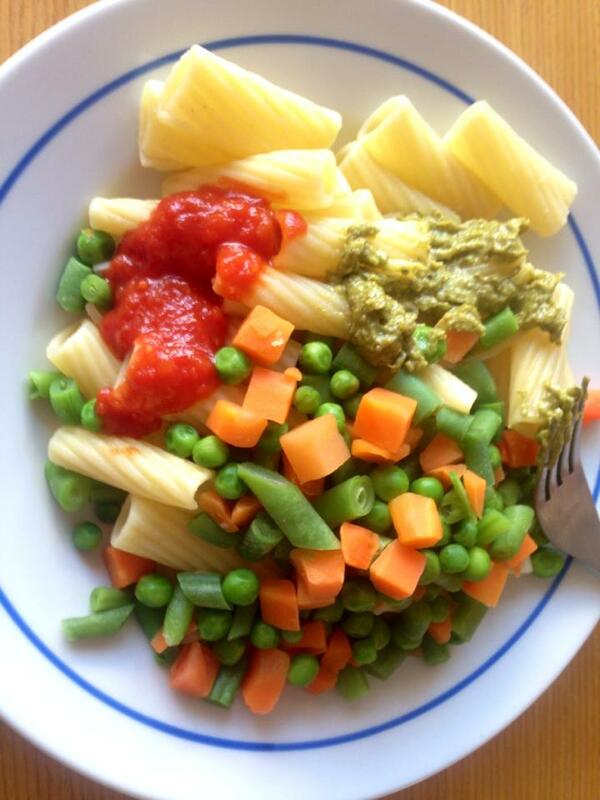 We made pasta, mixed veggies, and pesto and had olives and cheese and crackers as aps. I think it turned out pretty delicious. 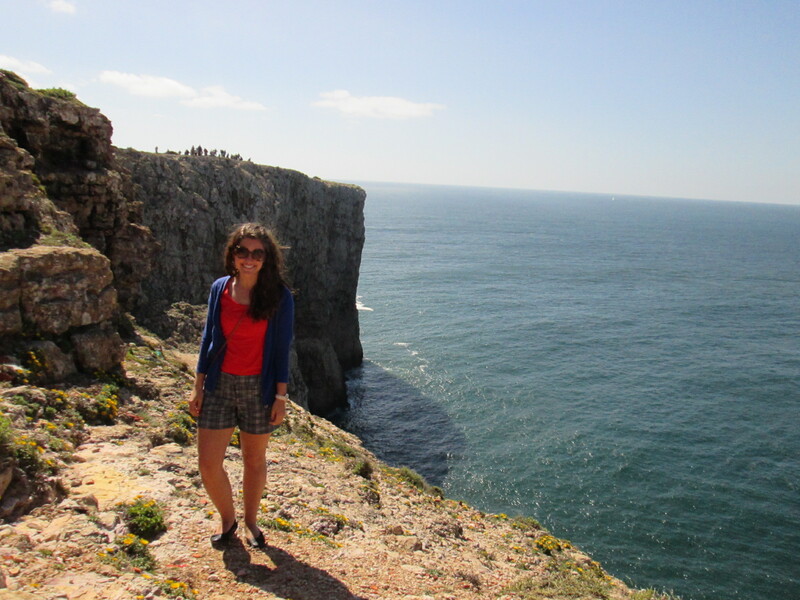 The following day, we went to Lagos, one of the most touristy parts of Portugal..but also one of the most beautiful. We first made a stop at the ¨end of the world¨. At Europe´s most western point, we stopped to feel what it was like to be at the end of the world. Before the age of discovery, Europeans believed there was nothing beyond the point below (behind me in the photo). It was kind of weird to think about being there for many reasons. How many people had stood in that spot years ago, contemplating what lay ahead of them in the roaring ocean? And also, that that was the closest I had been to home since January, and was the closest I will be until May 24 when I depart from Madrid to begin my journey back to America. I yelled ¨I miss you¨ nice and loudly to my mom and dad and Jay. They didn´t answer. You all have some explaining to do, ignoring your daughter like that ;). Later that day we spent time at the beach enjoying relaxing, reading, and chatting. It was a beautiful beach with places to explore. Although some people think that maybe I don´t go to class as often as one would think while studying, I really enjoyed a weekend deticated to really relaxing. It was a nice change of pace from the usual running around, sight seeing that I have been doing on weekends away. 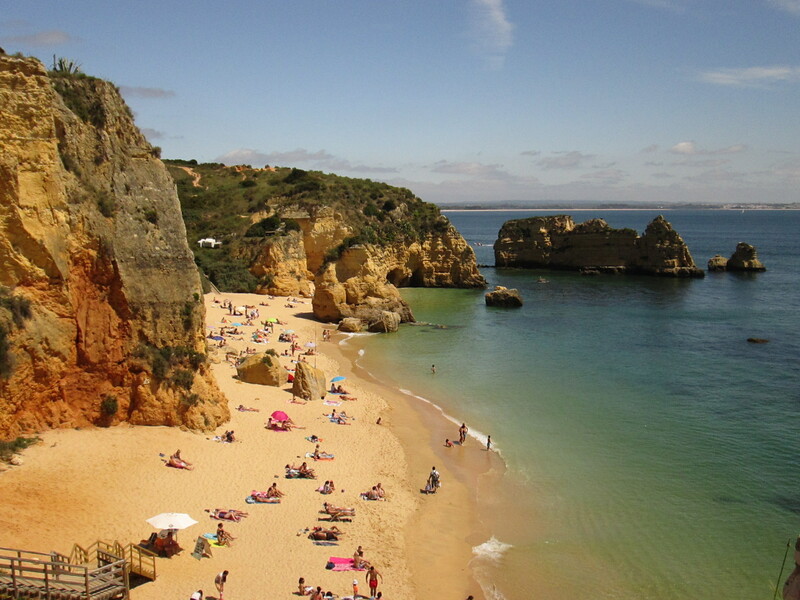 I didn´t have to worry about bus times, museum opening hours, how long it would take to walk somewhere..I just enjoyed the beautiful beaches of Portugal. The sand was soft and orange, while the water was crystal clear and blue-green. How is it possible that the Atlantic Ocean looks this stunning here, but at home it looks like dirt? I really enjoyed time in this new country and I would definitely return one day! I hope that everyone reading has the opportunity to explore and relax at a beautiful place this week, whether it be the sunny beaches of Lagos or your armchair with a good book. Remember to take some time to reset and unwind! HELLOOOOOOOOO……..You didn’t get my hello because of the 6 hour delay Miss 30 second! Jay, thanks for making me laugh. Cracked up out loud in class. Love and miss you! Oh I forgot to ask, Do you ever go to class? I felt a breeze blow by my ear while I was outside and I am pretty sure I heard it whisper something just out of reach! I love you so much and I am so happy you are having a great time, filling your mind with wonderful memories! One day I am determined to go to Lagos just to receive your message and answer you! Tener una buena semana en la escuela!